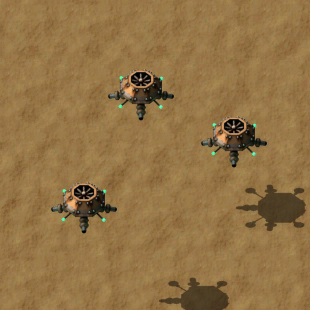 A capsule which, when used by left-clicking, will spawn three Distractor robots at the players cursor. Distractors have infinite laser energy and will hold their general position, attacking any enemies that come within range, until they are destroyed or their lifespans elapse. Distractor robots can be useful for providing temporary defense for weak or undefended areas during Biter attacks. They are also very useful for drawing the fire of enemy worms while attacking Biter bases. Simply fire one or more Distractor capsules into the midst of enemy worms and, as long as they have not already targeted the player, the worms will prioritize killing the Distractors. Since the Distractor robot is stationary, it is unaffected by and does not count toward the Follower robot count limit imposed on other Combat Robots. The number of concurrently spawned Distractors is limited only by their lifespan, number of Distractor Capsules carried, and delay in spawning. This page was last edited on 21 March 2019, at 23:09.